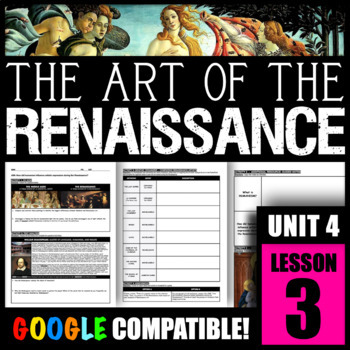 How did the Renaissance influence artistic expression? 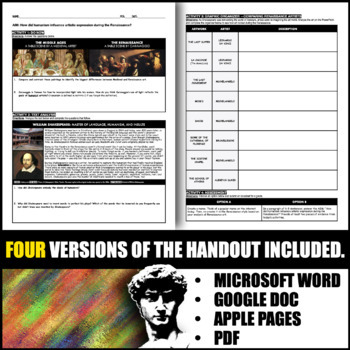 ACTIVITY 1 -- DO NOW: Students will read about the theatre world of the 16th century and read about what life was like at the Globe Theatre in London. Students will also analyze words invented by Shakespeare in order to express the humanist values of the day. 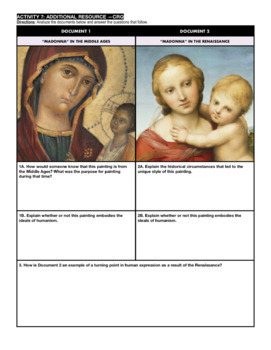 ACTIVITY 2 -- GRAPHIC ORGANIZER: Students will complete a graphic organizer where they will analyze and describe Renaissance art by Da Vinci, Michelangelo, Brunelleschi, and Durer on a PowerPoint (which is included). ACTIVITY 3 -- CRQ: Students will analyze a CRQ to compare and contrast art of the Middle Ages to art of the Renaissance. 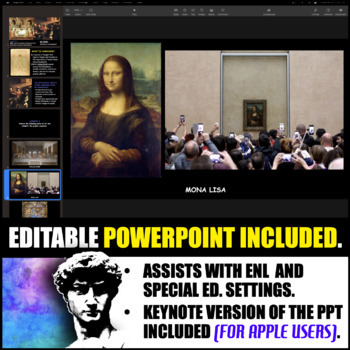 ADDITIONAL RESOURCE INCLUDED: PowerPoint with photos of Renaissance art.